It’s eight o’clock on a Monday morning and you can hear the tell-tell signs of a restaurant in full swing of beginning another day. Of course, he is. 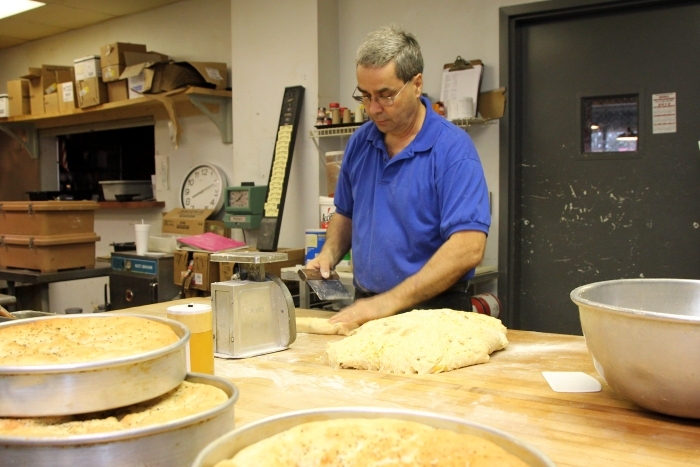 It’s where you find him every morning – as early as 3:30 or 4 a.m., making bread from scratch for Rooster’s and Basil’s in Fondren Corner. Tim calls himself an introvert, a behind the scenes kind of guy. But on this day, we talked him into talking with us. Meet restauranteur Tim Glenn. Tim Glenn is how old and how long has he been in the restaurant business? Tim Glenn is 61. And all my life. He chuckles and rethinks his answer before running down a resume from here to New Orleans. Really, I guess it was 1972 (I started) at TGI Fridays in Highland Village. I was a waiter and bartender while I put myself through Hinds Community College and then USM. I moved to Hattiesburg and worked as a bartender at the Mattadore Lounge for two years. My son, Nathan, was born there. While I was still in school as a criminal justice major, a (Mattadore Lounge) customer who owned a chain of Western Sizzlins came in. I decided after meeting with him that I enjoyed the restaurant business and thought I’d pursue that opportunity since I had a family. He hired me as a manager trainee in New Orleans and, four years later, I was his general manager of restaurant operations. I had seventeen locations under my belt and worked for him for four years. After that, I wanted to go back to single unit operations and there was an E.L. Saturdays, a version of T.G.I. Fridays, in Gulfport, owned by Tommy Boutwell and Stuart Sergeant. They were trying to make their mark in the business. I was general manager and it was, at the time, the highest volume bar on the coast, right along Highway 90 on the beach. Then Sergeant opened Yesterdays in Mobile (another version of TGI Fridays.) So I left and ran that. During that period, I had gone into business with my father-in-law for a bar in New Orleans. It had been the last stag bar in NOLA. We had poboys in the back and a full bar. I stayed there until I got a better offer. Stuart Sergeant called me and asked if I wanted to buy Yesterdays in Mobile. I took it on a one year option. Then, I did another place with Stuart, a mesquite grill called Tiajuana Country Club. I didn’t exercise my option and came back to Jackson in 1984. And that’s when Rooster’s on Roach Street came about? Yeah, Roach Street across from the Mayflower Cafe. We were there for eight years. We’ve had five or six locations with ten years in Clinton. Then, on Highway 51, we had Rooster’s 2, with a childhood friend who partnered with me, in Ridgeland. In 2003, I was backing out of the business and my son, Nathan, wanted into the business so I helped him get his start. It was an automatic hit for him. I opened Basil’s in Fondren as a retirement gig. That was the original. From there, we expanded to other restaurants and ten years later, we’re still baking bread in Fondren. Nathan selected Fondren. I wanted to let him work out his dream. He did the site selection and chose here because he saw an opportunity and he was right. Nathan said the hospitals would be here. We do good food at a fair price. You obviously have not retired. Obviously. Those with children understand. Oh, there’s time. I’ve taken as much as a year off. Last year, I rode my bicycle to Phoenix. I spent six weeks on the road, across the Mexican border and across the Rockies. I’ve always cycled. Growing up in a modest income family, a bike was my transportation. If I needed to go somewhere, it was me and the Schwinn. I didn’t get a car until I was 22. The bike was a utility. I’ve always had a bike in my closet. I’ve ridden to Mobile and Memphis and back. Even in high school, I’d take off for two weeks during the summer and have an adventure on a bike. It’s solitary cycling. It’s a different speed than walking or a car. You experience the trip. I mean, the destination is the trip. And, it’s a healthy experience. What about your food? What about your restaurants makes them what they are? It’s simple food. We use quality ingredients and quality technique. We don’t do anything too complex. We don’t play jazz. I’ve learned a lot from independent cooks. I’m not formally trained. But, I worked with some of the old Green Derby Cooks and Paul Apostle, Nick’s dad. Our bread comes out of Mr. Apostle’s restaurant. I learned how to bake bread and dinner rolls there. And, we still cook. A lot of restaurants have gone to heat and serve. I grew up in a lot of independent restaurants and they all cook – and they always had a dining room full of people. It’s enjoyable. Someone enjoying your food? You know, it’s an affirmation of your work, I guess. It’s not always about income. After all these years, has it been worth it? Yeah, it’s worth it. It was either this or be a carpenter. But this was available to me so that’s what I did. I’ve always enjoyed wood work though I’ve since let it go. I built a house one time. It took me five years but we got it done. It’s one of my best experiences of life so far. I had professionals to help me and guide me and give me leadership on it. But it was all square and plumb. A little 600 square foot cabin in the woods. I’m an introvert. I’d just as soon stay in the shadows. Truly. I don’t have any self-importance problem here. It’s me and my family. That’s about it. I have three grandchildren and my wife, Kathy has three. So we have six grandchildren from 11 down to 3; stair steps. It’s a lot of fun. I have two kids: my daughter Ashley and Nathan. As a matter of fact, my daughter and son-in-law, Michael, operate Basil’s downtown and Congress Street Bar and Grill. Nathan and his new wife (Megan) operate Rooster’s and Basil’s with me and also our new pizza house in Belhaven, Basil’s 904, if I may plug. It’s a family gig. How’s it working with family? I’ve heard stories of you accidentally scaring people who come in early and don’t realize you are here. Are you a morning person? You’re a morning and night person in the restaurant business. I like to get the day going and get ahead of everyone else. It’s lunchtime for me by 8:30 a.m. I’m up at 2:30 a.m. I get my coffee, do my computer work and play my ukelele. I play ukelele and harmonica. Blues harp and blues ukelele. It’s kind of cheesy but I do it. I played as a kid but I don’t consider myself a musician. But music’s for everybody. So, restauranteur, musician, entrepreneur, cyclist; I guess we could call you a Renaissance man? A little bit of everything. Yeah. For an almost carpenter, do you see lines and shape and form when you cook? This is our 28th or 29th year. It becomes manufacturing. We’re making a product. We’re a business. We’re not a creative restaurant. Nathan’s playing with creativity a bit over at 904. But once you get your model tweaked out, you leave it alone. But it’s still manufacturing with a personal touch, right? Everyday. Everyday. Everyday. You’ve got to manage ingredients, time, temperature, people. It’s science. It’s edible chemistry. Plus customer service. You manage your tolerances and keep it all in line. We receive raw material, make a raw product and we take the raw product to the finished state. We sell the product and we deliver the product. It’s an all-encompassing business. It looks simpler than it is but it’s not difficult. Great life story! Great people and awesome food! Keep on keeping on!